Also a man named Zarian got Baptized this week by Elder Huntsman. 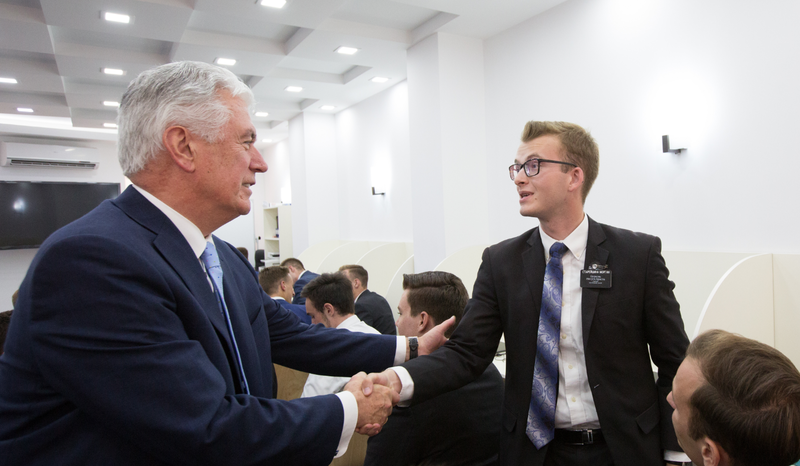 Elder Bekker and Elder Huntsman taught him, he has come to our church for about 6 months, and now is a member of the Church! He’ll be great, we need more priesthood! We also are teaching two people that we have high hopes for right now. Our Friend Igor almost has a baptismal date for the 17th of December, he hasn’t agreed to it, but we’ve already challenged him twice to baptism. We are going to meet with him tomorrow to start the lessons about commandments. Also our Friend Ludmilla is progressing. She has declined our invitation to be baptized, she said she prayed to God and got an answer that he Baptism earlier in life was enough, and that she doesn’t need to be baptized again. We will talk to her more in depth about the Great Apostasy and about the need for proper priesthood authority to Baptize.